Sometimes, a new design or product will capture your attention and imagination to the point of obsession. This is what happened with me and the Nightshift shawl by Andrea Mowry. The combination of colors and the visual texture she created are mesmerizing, and the effect didn’t wear off after a few days, or even a few months. 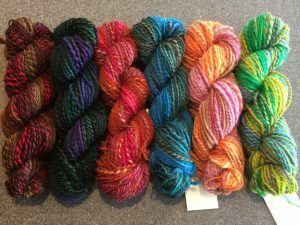 So I thought about creating similar yarns using my own handspun. And thus, my latest spinning project took off. 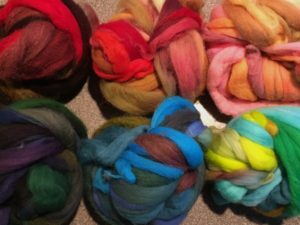 Constrained by the fiber I had on-hand, I set out to make 6 distinct yarns: 3 warm, 3 cool, with different values from light to dark. In the strictest sense I achieved this part of my goal. The yarn is thicker overall than I had hoped, and in a few cases the colors matched up oddly. But I love seeing the way that inspiration flows towards an end result, however different it may be from the original intention. To date, this has been the most invigorating spinning project I’ve taken on. Never before have I thought about spinning all day, and rushed home after work so I could spin in natural light before sunset. 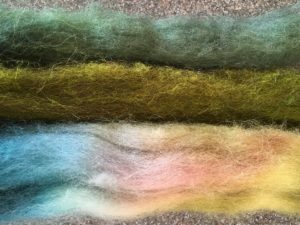 The preparation was engaging, the spin itself was fun, and the end results are…. 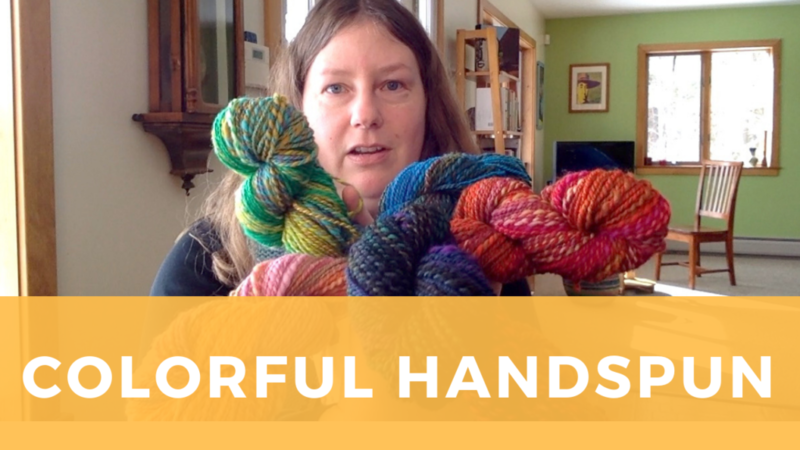 well, they’re mixed to be honest, but I learned a great deal and I know that I’ll be able to make something interesting with the resulting yarns. While I won’t be making a Nightshift with my own handspun, but I’m sure whatever I do make will be equally fun to knit, and hopefully a joy to wear.